Home >> Selenium Tutorials >> How to run webdriver in IE browser? Note: Choose the IEdriver server based on your working environment as there are two different zip files for both 32 and 64 bit IE . Recommended 32bit IEDriver which is less prone to errors when compared with 64bit driver. Save the downloaded file to your local machine. Please find the below example program for running webdriver in IE browser. It has a test method which will validate google home page title once when the browser is opened. As we all know, InternetExplorerDriver works only with Windows system and the execution speed is slow Comparatively to other browsers. However when working with InternetExplorerDriver there are some issues with mouse events when the browser window does not have focus, and attempting to hover over elements. 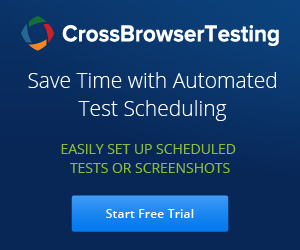 Your test scripts may work fine with Firefox and Chrome browsers which are intelligent enough find the elements in the DOM, but Internet Explorer is slow because of which you will end up with an exception. To avoid issues when executing scripts with Internet explorer, try to use 'Css selectors' which will minimize your issues. When ever working with Internet explorer browser for Selenium webdriver, the below are the common issues that you may come across. 1. If see issue some thing like 'Unexpected error launching Internet Explorer' below, You have to set 'Enable protected mode' option in all levels with same value. 2. 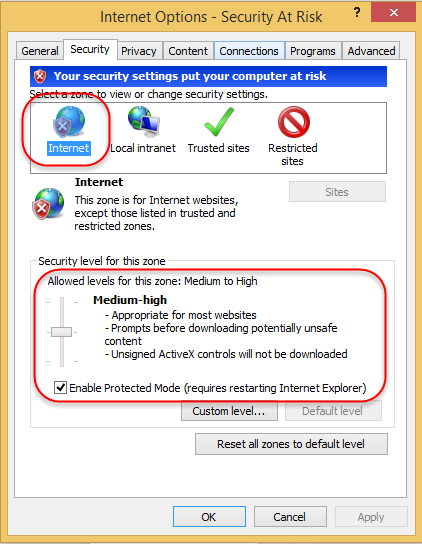 Select Security Tab --> Select Enable Protected Mode option -- > Check the default Zone level for 'Internet'. If you look at the screen shot below, security level for this zone is selected as 'Allowed level for this zone : Medium to High.' and 'Enable Protected Mode' option is Checked. Now you need to make sure that, for the other Zones, such as 'Local Internet' and 'Trusted sites' is also selected as ABOVE. You may don't need to do anything with 'Restricted Site' option. We can leave the option as is and by default 'Enable Protected Mode' option will be Checked. Now after changing the settings, please click on 'Apply' and 'Ok' button. But how ever, the first option is advised and it is not that hard to set internet explorer browser settings. 2. Make sure that the IE browser zoom level is set to 100% so that the native mouse events can be set to the correct coordinates. 3. It may be silly one, But make sure you provide correct path when setting the property of Internet explorer driver. Hope you will Run your scripts in IE browser without any issues. ‹ How to Run Webdriver in chrome browser? 1. Open the internet browser, go to tools> Internet Options> Security and check the option(Enabled Protected Mode) for all the zones(Internet, Local Intranet, Trusted Sites, Restricted Sites), apply the changes and click ok.
2. Go to option 'View' and set the browser zoom to 100%. Now run the code again and there you go. Thanks for sharing. How do I run this code and where do I do that? I have a browser and selenium IDE installed. What I don't understand is what command to execute in CMD so that my script recorded in Firefox will run in IE or Chrome. Can you help? In my system exe is not present. I am running this through webtop directly application of IE. Please let me know how to resolve this query ? how to do loacte elements in pop ups in IE browser? as after coming alertbox developer tool is not launching..